I am currently serving jury duty for the City of New York. Hopefully, today will be the last day, and I wont get called to sit on trial (I do believe serving as a juror is important, but I do have other things going on in my life). Luckily, there are some kosher options not super far from the court houses located in downtown Manhattan. Kosher Info: Yesterday I ate at Broadway Kosher Cafe, a typical dairy joint found in Manhattan, serving pizza, pasta, falafel, and similar grub. The place is downstairs, so dont bother if you’re in a wheelchair. The pizza was really good. Most NY pizza is good, but still, it was good. Wasn’t such a fan of the vibe of the place, but since it’s competition, Circa, closed down around the corner, it’s the only kosher pizza place in the area. Boradway Kosher Cafe is located at 160 Broadway off of Cortland, and around the corner from my favorite place to shop: Century21. I ate here about a year ago. It reminded me of Kosher Delight but not as good. It is a fast food deli. Nothing special. It is behind the OU office building and also near some great shopping: SYMS. The Kosher Subway on Water st. is now closed. Tourist Info: Ground Zero is a tourist attraction, but there is really nothing to look at other than construction and a massive hole. There is actually some great shopping downtown. Century21 is probably the best department store in the city, it’s just an amazing discounter. SYMS is also good for mens suits and other attire. There is also J&R, voted as New York’s #1 electronics retailer by Zagat. Fulton st. is a great place to find stuff to buy on the street with many vendors out and about. About a 10 minute walk north of City Hall is Canal st. which is filled with many vendors selling knock off handbags, sunglasses, scarfs, and other faux name brand items. You can also buy many cultural Chinese and other Asian products there as well. Great place to get sushi plates and chopsticks. 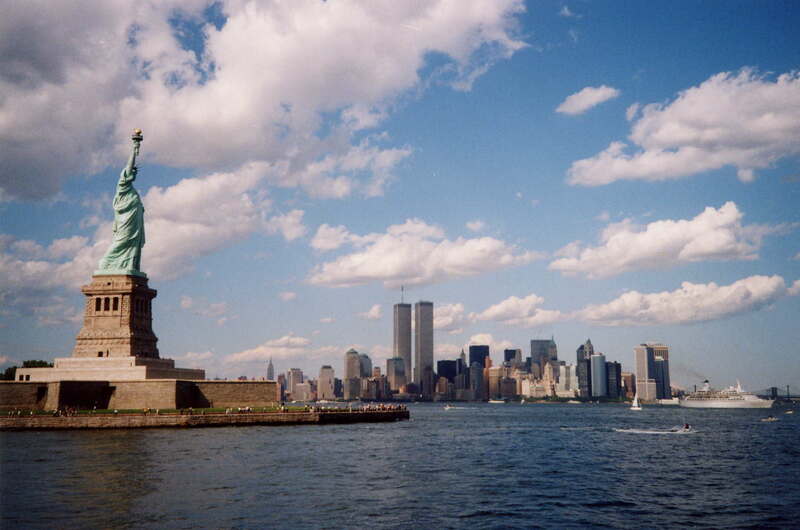 This was a picture I took in the Summer of 2001. I was on a ferry to Ellis Island. Battery Park is a nice place to have a picnic and take pictures with lady Liberty. From Battery Park you can take a ferry to Ellis Island and/or the State of Liberty. Nearby is the ferry to Staten Island, pointless, unless you have something to do on that island other than dumping your trash. 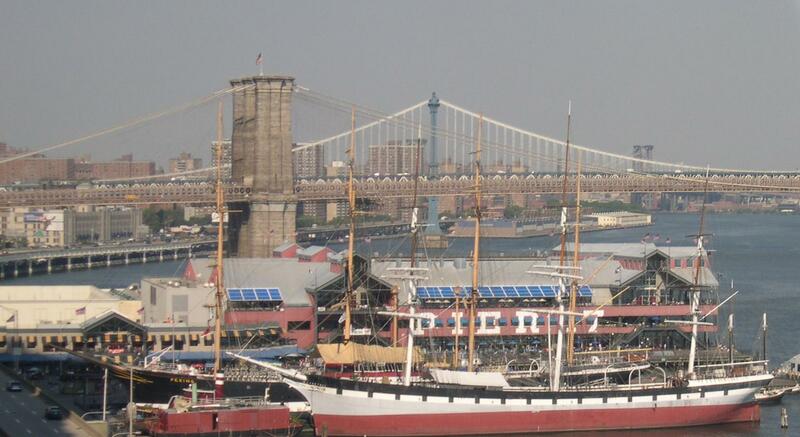 About a 10 minute walk from Battery Park is the South Street Seaport, which is basically a mall and a set of historic boats. It is a very pretty area, worth bringing the camera for, especially with the views of the Brooklyn and Manhattan bridges. Jewish Info: Downtown you will find the Museum of Jewish Heritage. While it mainly focuses on the Holocaust, it frequently has other exhibits on other Jewish issues. The museum is located at 36 Battery Pl, right on the Hudson River. You can get some gorgeous views of the Statue of Liberty from there. This region is mainly a financial and tourist area. Synagogues can be found nearby in the Lower East Side, Greenwich Village, and further north near NYU.